"You're all done! That is so great!" I've heard this quite a few times in the last few weeks, understandably. Yes, God has fully provided for the school construction. The funds have been raised through tremendous support from all over the globe. Although there were administrative costs to raising the funds, we covered them, and the full $30,000 has been provided. ... but we can not rest. The estimates arrived yesterday from Touch A Life Foundation for the in-country travel expenses. They estimate that we will need roughly $1200 per person for our transportation, lodging and meals. Transportation may very well be the most expensive cost, as it takes all day to travel to/from the Lake Volta area. It's more than we anticipated. This is above and beyond what we've already paid for visitor visas, vaccinations etc, and does not include the cost of the Compassion visits. Those costs are covered by the sponsor so as not to take away financially from Compassion's ministry, which I applaud and appreciate. There are four of us going.... Debra, Tia, myself, and my 13 year old son Joshua. Together, we have a little more than $2500 for travel costs. That leaves a seemingly impossible $2300+ to raise in less than a week. May I confess? While I had sun stand still faith that we would raise the funds for the school, yesterday, I struggled with the faith that the remaining $2300 will be raised in time. All I could do yesterday afternoon when we received the estimate was think of the 2 photo sessions I'm doing this weekend, the fundraiser at church on Sunday morning, and ask myself "Will that be anywhere near enough?" I know... I know GOD alone is enough, and that work of my hands can not provide as well as He can, and that we simply must trust -- it IS as simple as that... but in those moments yesterday, I had to borrow from Debra and Tia's faith to find peace. I'm still learning, growing right along with you. This morning, my strength is renewed, my faith refreshed. I do understand that we didn't know how God would provide for the school in such a short amount of time, after all, we were still at 12% in mid-September. And yet He did, in ways only He could. We're back in that boat. We don't know how He will provide for the travel expenses in such a short amount of time. We don't need to know in order to know that He can -- we know He can. We just need to trust that He will and rest in Him as we do what we can to rest in preparation for our time in Ghana. Joshua: "Mom, can you write in the dark?" Me: "Don't know, I've never tried... why?" 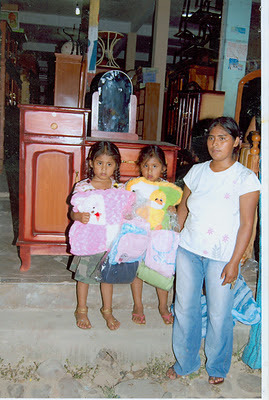 Joshua: "There's this test you need to sign..."
A few months ago, we had sent a family gift to Lizbeth in Bolivia, hoping that it would provide for the needs of her and her twin sister. A few days ago, we received a thank you letter from Lizbeth's mother, Sonia. She expressed her gratitude for God's provision for the family. 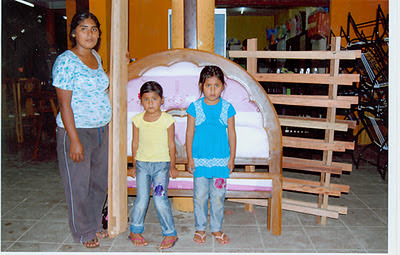 The girls had really needed a bed, and with the family gift, they were able to provide one for the girls. It was sweet to see how much the girls have grown since their last photo. So thankful that the girls received this beautiful blessing. We've spoken of it often through letters -- Joshua and Ato Sam playing soccer together. Joshua promised to teach Ato Sam what American football is, while Ato Sam promised to play a friendly match of soccer against Joshua. In 16 days, this drawing will come to life as he and Joshua play soccer together for the first time. It's OK if Canada loses miserably... because all scores aside, everyone will win in that match-made-in-heaven. 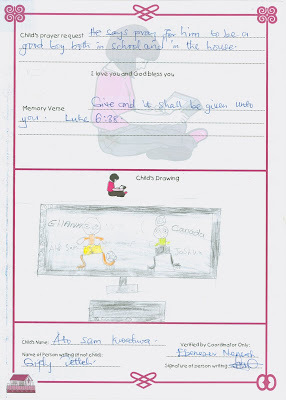 In a recent post, I had mentioned sending books to our Compassion children, especially Ato Sam, to whom I've sent a book with nearly every letter. 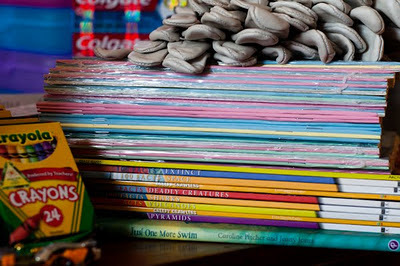 Many of you have asked on the blog or on OC about sending books to our Compassion children. The books must fall within the correspondence guidelines, which are 8.5 x 11 x 0.25", softcover. When I send a book along with a letter, I don't typically include anything else other than stickers. I read everything before sending it, to ensure that there is no magic, nothing that focuses on material wealth or spoiled kids, and that each book has good moral or educational value. I also try to make sure the English isn't too complex. Some of the books Ato Sam has are great for having his older brother read to him, and some he's starting to read on his own. Given that we support 13 Compassion children, it is important to me to find great books at very low costs. Twice a month, I'll drop by the used book store and search the children's section to see if there are any appropriate books to send. Community book sales are great too.Many times, I have found great books for 25 cents, 50 cents or a dollar. Saving money on these books helps me be able to continue to send him books, AND still be able to afford to sponsor him. I've found new books at great sale prices too. Here is a sample of the books I've sent. In some cases, the paperback version that fits the Compassion requirements weren't available online, so I've simply linked to the book itself in whatever format I could find it. I've also sent mazes, quiz and puzzle books as well. These were great yard sale finds, 25 cents each! The "Ten Things You Should Know" series are great -- found them for $2 at a store closing sale. I sent a few more titles than these, but I couldn't find them online. 100 Facts – Extinct (this one was a bit bigger, so I trimmed it down with the large paper cutter at work)... I found these for $2, and got the entire collection. I will be bringing them directly to Ghana rather than sending them with the letters. They are fantastic. These are almost impossible to find under $4 each, but they're great for Spanish speaking kids. They have a whole collection. I've sent similar (English only) ones to Ato Sam. There are more, but these will do for now. I've also sent the Rainbow Fish book to Novet in Uganda. I haven't always sent books to Ato Sam with his letters... but when he shared about the book shortage in his village and how desperate the children are for educational resources, I began to do what I could to send books along with every letter. I sometimes send books to my other children as well, just not as often. Time and time again, he rejoiced as his friends were chosen by sponsors from far away countries. Meanwhile, he couldn't help but wonder when his turn would come, and who would choose him, this boy who struggled academically. Once he had a sponsor, would his sponsor cancel the sponsorship as he'd seen happen time and time again at the Compassion center? Then, on the 444th day of waiting, his prayers were answered. God had chosen a sponsor for this boy, He had told this sponsor this boy's name, then commanded her to search the world over for him. She knew when she saw his name, which means "Born on Saturday, God has heard! ", that he was the one. As sponsors, we are called to be spiritual leaders in the lives of these precious treasures, but time and time again, I see these children being the leaders in our lives, inspiring us, challenging us and stretching our perspective. Ato Sam used to struggle quite a bit in school, and often shared the challenges he faced and how difficult it has been to further his studies in light of the lack of educational resources in his community. There are no books in his school... no books... although he now has more books than anyone in his village, simply because I send him a book with almost every letter. Knowing how much he has struggled, we received his latest news with such joy!! He dedicated this award to me, but it is God who has provided everything he needed, including an encouraging sponsor. "To the excellent award winning scholar, Ato Sam!! The news of your award brought us all such joy, Ato Sam, we are SO proud of your great success in your studies! In many ways, Ato Sam, you remind me of the beloved Joseph of the Bible, whose life was anointed and whom God used to lead his community and nation to prosper through times of famine and great need. Never underestimate your potential as a follower of Christ! Although Joseph faced many difficult challenges and situations, it is his faith, his lack of anger, his wisdom and his beautiful heart that set him apart and greatly honored God. He had God’s favour upon his life, like you do. Have you read this story in your Bible? It is found beginning in Genesis 37. Did you know that this is one of my favourite stories from the Old Testament, as well as Jillian’s favourite? What did you think of Joseph’s life? I have always been very proud of each and every one in your family, including you, but I am especially excited about this award because through it, God has given me a beautiful glimpse of how God is shaping your future, even though I had seen it for many months now. You, Ato Sam, are being shaped into a leader for your community, for your nation, for God’s kingdom. I do not know if you knew this, but there are 4 main areas of ministry at Compassion. Sponsorship is the most known ministry at Compassion, but there is also Child Survival Program (CSP), Complimentary Intervention (CI), and Leadership Development Program (LDP). “The nations are crying out for good leaders – men and women equipped to lead their countries out of the despair of poverty and into a future of promise and purpose. The Leadership Development Program gives students with exceptional academic ability and leadership potential the opportunity to do exactly that. Students receive a university education, participate in leadership training and are discipled in the Christian faith through their active involvement in local church. What this means is that when you graduate from school and are ready for university, if you are a Compassion child who qualifies on the following… you too can apply for the Compassion Leadership Development Program when you are older. If you are accepted in this most amazing program, you will transfer from the Sponsorship program to the LDP program, which means that you will be sponsored and supported through Compassion while you attend university. Our beloved friend and brother in Christ, Ebenezer Mensah, can surely offer you more information on this, especially on the requirements which need to be met in order to qualify. Talk this over with him, and encourage your Compassion brothers and sisters in doing their best so that they too, can work hard for this potential opportunity. Not all who apply are awarded with an LDP sponsorship – it is very special and rare – but I believe in you, Ato Sam, I know that God can give you all that you need to achieve this special honor. Shall we pray for this to come to pass Amen?! Yes, we will. You may want to share this information with your mother and your father, so that they can pray for this opportunity. I want to celebrate your great success in school by praising God for His blessings upon your life, and by sending you a visual reminder of all that He is preparing you for. With this letter, I am including the Compassion International Leadership Principles picture. It includes all the characteristics of great Christian leaders, as well as scriptures that I want you to memorize and keep in your heart so that these scriptures will become like a lamp in your heart – those Words from God will light the path ahead of you, son. Let this scholastic award that you have received give glory to God for all that He continues to do for you and through your life… He has provided all that you needed to succeed, as He promised He would. God is great!! With all our love and congratulations on this excellent news! Please share our love and prayers with your entire family, and tell them that they are in our hearts. It has been proven that children whose sponsors write regularly see a marked improvement in their studies and grades... proof once again that our letters have weight in these children's lives, and that sponsorship isn't simply about the monthly financial support. Please... write to your sponsored child. Don't know where to start? A simple note to say "I love you. I believe in you. I am praying for God to continue to provide all that you need to achieve much success. I am proud of you. You are special to me." It doesn't have to be complex, eloquent, and long... it just has to be written and sent! It will make a world of difference in the life of your sponsored child, his family, his community... and in yours. If you don't yet have an Ato Sam in your life, will you consider sponsoring one? Click on the "Sponsorship" Photo Link on the header at the top of this page, and find the child who has been waiting for you. 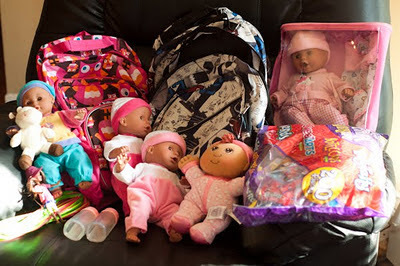 I have four child packs here in my hands, if you are interested in knowing more, simply let me know! Back in the spring, I had written a devotional for our Compassion children and sent it to them as that particular month's letter. 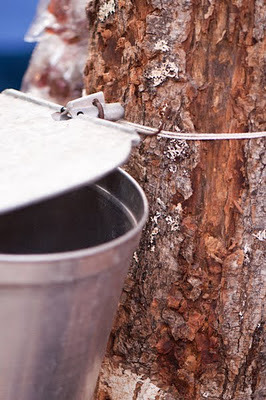 The devotional explained what maple sugar trees are, how they are tapped and how sweet syrup is produced. I included some photos that I had taken of the process from up close. The end of the devotional explained that as a child, I had felt bad for the trees that "got hurt" (tapped), but that later in life, I had learned to see the entire process as a reflection of a Christian life. Jesus was pierced, He had to endure much hurt even though He was innocent and pure... but that in the end, it was through His death that we were given the sweet gift of life. Much the same, when we endure hardships and difficulties, those very hardships and that process can be used to glorify God and bring the sweetest of treasures. Example, the life of Joseph (and the multicolored coat). 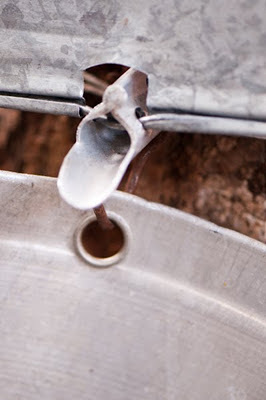 "He says he thanks you for the maple tree which show how the liquid were collected. He says you always encouraged him through your letters. He says at first, he was not getting what you are trying to say, but now you have made [sense]. He says he has learnt a lot from the maple tree's story. He says he has understood that sometimes, you need to go into difficulties then God will raise into Glory. He says the first day that he heard the story of Joseph, he became very sad. He says he did not understand why should Joseph suffer while God is with him. 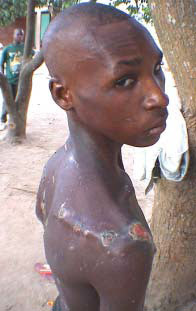 He says finally God used pains and the bad condition that Joseph was in to bring glory to God. He says he believes God loves you so much that is why he has made you like Joseph. Ato says you taught him a lot and God bless you." Your letters to your child are priceless -- never underestimate the impact you can have by simply sharing your spiritual walk with them, and discussing what God is teaching you. Grow in Him, together. For more letter writing ideas and to join other sponsors in their sponsorship experiences, join us at OurCompassion.Org! "Ato says he is also praying that he will see you face to face [along] with Tia. 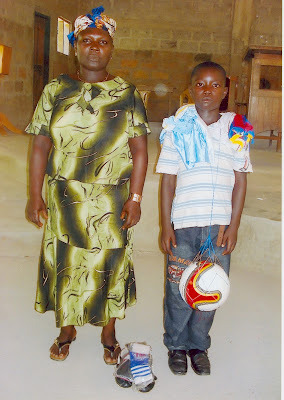 He says on July 12th, 2011, a sponsor came to his project to see his sponsored child. He says he wished he was the one. He says the sponsor was from Canada. He says he believes that God's time will be the best." On Sept 14th, 2011, I wrote a letter to Ato Sam, with a cover page addressed to his Compassion Project Director so that the letter would only be given to him when it was time to share the news. The letter shared how God had answered his prayers, and in three pages, detailed how God led us to Ghana through him, and how his faith and his prayers moved our hearts and God's, how he inspires and leads, the potential his life has... and how his prayers even changed the future for so many children in Ghana. "I was amaaaaaaaazed to learn of this!" 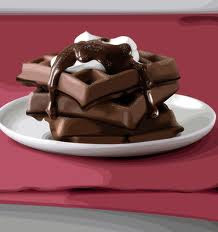 I wouldn’t quite say that I have been a chocoholic, that is, addicted to chocolate, but I have enjoyed chocolate treats over the years. 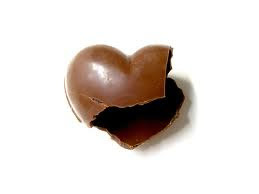 I remember craving chocolate when I was pregnant with Joshua, sharing Easter treats with the kids, and getting excited about visiting the Lindt factory outlet in Kittery, Maine, when we travelled south. Sometimes, I’m sure that even though PMS is a thing of the past, my body still tricks itself into craving chocolate at least once a month. Old habits can be hard to break -- but not always. This past year, having grown increasingly aware of the realities of child slavery and getting involved in putting an end to slavery in Ghana, has caused my heart to see the world through different eyes. The documentaries I saw a few nights ago on the cacao industry of West Africa has completely changed how I view chocolate. Nearly three quarters of the world’s cacao bean production happens along the West Africa coast, especially in Cote D’Ivoire and Ghana. In those countries, thousands of children are enslaved in the cacao industry in order to keep up with the lucrative chocolate industry demands. These children, many of them taken from other countries such as Mali or Burkina Faso, work up to 100 hours a week in remote areas, away from the world’s eyes. They are poorly fed, unable to attend school, beaten, and never see any profit from their exploitation – their cycle of poverty unbroken. Just like the children of Lake Volta. Suddenly, chocolate isn’t so sweet. 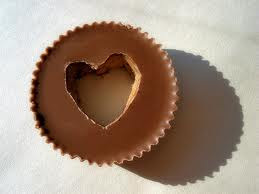 I am aware that saying goodbye to chocolate isn't enough. It’s all too simplistic to say that it will make a difference or an impact or help stop slavery. Child slavery is so much more complex than a consumer demand and indulgence issue, and chocolate isn’t the only product that has been darkened by child slavery. Yet, just as I shared in Left Behind, "I consider that sometimes, the difference we can make seems so small and seemingly insignificant... but even when we can not do much, we must not shy away from the little we can do." No, my choice is personal -- a personal matter of the heart, a personal experience of conscience, of conviction, of priorities. The same happened with my choice of music to listen to, the choice to not watch TV, and more -- a simple shift of perception that told my heart "It is not well with my soul." Long after the decision was made, I read a statement one of the child slaves shared with any who would hear him. "Tell them when they are eating chocolate, they are eating my flesh." That was all the affirmation I needed to know that for me, this was the right decision. 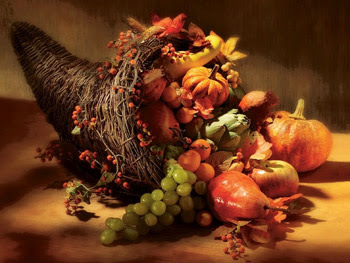 As our Canadian Thanksgiving approaches, our home is filled with colors, but not the kinds you'd expect. 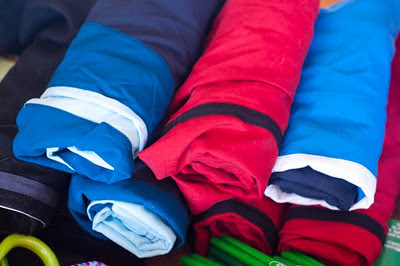 Our coffee table overflows with bright yellows, lively reds, bold blues, and every color combination imaginable, reminding me of one of my favorite childhood memories -- gathering school supplies with my mom each August as we prepared for another school year to begin. 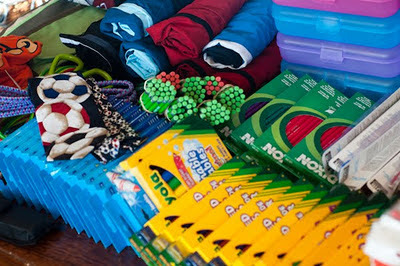 Pencils, erasers, markers, pencil crayons, leather gloves, notebooks, skipping ropes, toothbrushes, soccer balls, swim shorts, backpacks, toothpaste, dolls, matchbox cars, pencil cases, and more -- all harvested with the help of back-to-school sales and clearances, little by little, item by item, gathered by family, friends, co-workers. 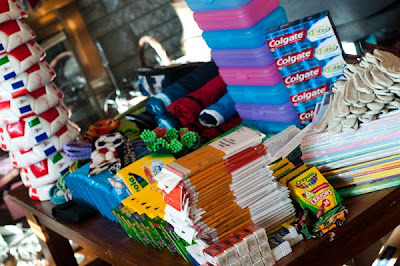 A colorful cornucopia gathered to bring to Africa, where, less than a month from today, children will have the joy of new school supplies and basic toys -- simple joys that we all too often take for granted. with great pictures and interesting facts... $2 each! Leather gloves for the men - $20, down to $3! Soccer tie, from my husband's collection of ties. interview for the Ghana Black Stars in a few years? 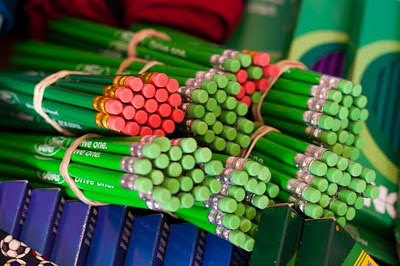 Pencils donated by Ford Canada, an unexpected blessing. along with skipping ropes purchased by her daughters. so that the air can be filled with sounds of joy. African-American dolls (even though they appear much lighter in the sunlight) -- ready to be held, loved and nurtured by little girls. From this harvest, we will be able to provide one pencil case to each of the Compassion kids' siblings, each with pencils, erasers, pencil crayons, toothbrushes, candy and a small toy. Each of the 4 Compassion children will get a backpack with the same pencil case and contents, as well as a very few extras. Their parents will also get a few small, practical gifts. All the rest, along with the harvest that Tia and Debra have gathered, will be supplied to the children we will be working with at the Village Of Life. 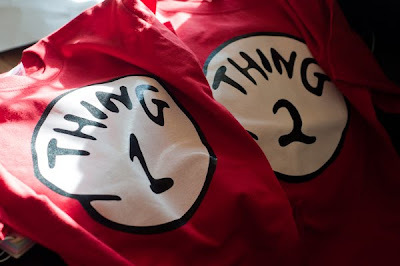 Everything that we're bringing was carefully chosen, with the lessons learned in "UnPoverty" kept in mind. Providing to developing countries must be done delicately and sensitively, so as not to bring more harm than good. Please continue to pray that we will provide wisely and that the children will be blessed by our efforts. We are still in need of a few specific items -- hand pumps for soccer balls (3), wall mounted pencil sharpeners (3, metal construction), toothpaste, toothbrushes, bandaids. Travel Expenses: As the end of the school fundraising approaches, we will be focusing our efforts on separate fundraising for in-country travel expenses. We are trusting God to continue to provide for this. As always, pray for the children being rescued, and the children left behind -- all over the world, not just in Ghana. Slavery is at all time high -- there are currently more slaves in the world than there have ever been, 80% of which are women and children... 50% of which are children. Although the Paypal Chip-In button displays our current Chip-In total of $3961.10, we are currently at nearly $14,000, through donations made to our non-profit account at Interlink Ministries. It may seem as though $14,000 is a long way from our goal of $30,000 to build the school, but rejoice and continue to pray and support this project -- we have great news to share very soon! In the meantime, the harvest continues. There is much work to be done... grateful to be working alongside of you in this. Could the children possibly be more beautiful? It's easy to see why I've fallen in love with Ghana. The people!